Previously it was reported (and the DOG lists) the fuel tank capacity at 22.5 gallons, but my order sheet shows a 93 liter fuel tank (#915) which is 24.57 gallons. 22.5 must not include the reserve. Blind Spot Assist (234) is standard; Active Blind Spot Assist requires DA2. Personally, I'm forgoing DA2; I like to drive and not be driven, and I don't think my wife has the patience to figure out all the options. Well put. I couldn't even tell you when I last used cruise control in my car. Just getting used to driving an automatic every day will be an adjustment for me as it is. This is three months old, but there is an offroad demonstration segment filmed at the Alabama factory in this German video. Last edited by GregW / Oregon; 11-11-2018 at 07:42 PM. Just watched a short video of production at the Alabama plant. The wheels on one look like the AMG GLE but probably prior Gen.
joe, for 96k you might consider waiting for the 53. if you are willing to wait for that, you might want to wait for the gls! and so on and so on. I placed my order today, pending the final DOG and any changes that may yet occur from M.B. Joe, Congrats - now the waiting! I made a few updates to the sheet later (see post #986). I could be wrong, but I believe the 20" AMG wheels are included in the DG1 AMG Line Exterior Package, and only the 21s are an upgrade. That's the way it is on the German configurator. Joe, Congrats - now the waiting! I made a few updates to the sheet later (see post #986). I could be wrong, but I believe the 20" AMG wheels are included in the DG! AMG Line Exterior Package, and only the 21s are an upgrade. That's the way it is on the German configurator. Thanks Greg. I may make a few changes along the way but at least I'm in the system which helps the dealer procure the allocations. 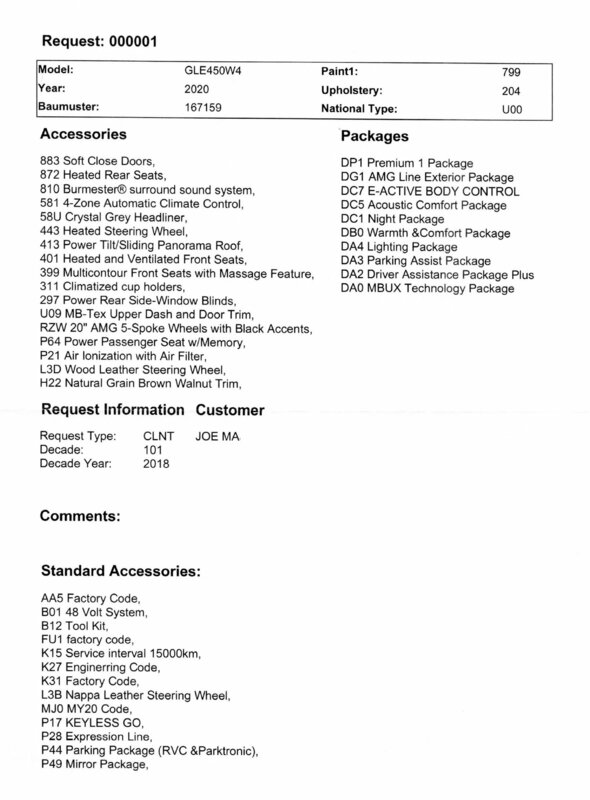 As for the pricing on the RZW 20" wheels, that's the pricing the dealer printed off their system today. I attach a copy of the actual order. One thing my dealer mentioned, the $8,100 E-ABC may be one of those options that is delayed at launch since so few of them will be ordered. He ask if I wanted to go with an Airmatic system instead if it's delay, I said yes. Thanks Greg. I may make a few changes along the way but at least I'm in the system which helps the dealer procure the allocations. As for the pricing on the RZW 20" wheels, that's the pricing the dealer printed off their system today. I attach a copy of the actual order. Backing out VAT, German prices are 900 euros for the AMG 21s & 1900 for the 22s (which we don't get on the 450). One thing my dealer mentioned, the $8,100 E-ABC may be one of those options that is delayed at launch since so few of them will be ordered. He ask if I wanted to go with an Airmatic system instead if it's delay, I said yes. I hope this too is not the case. I had to wait 6 months on my '12 to get the Dynamic Handling & Lighting packages. The way they've been promoting & featuring E-ABC along I would think it would be ready to go. Last edited by GregW / Oregon; 11-12-2018 at 10:25 PM. Hmmm....I hope that's not the case. 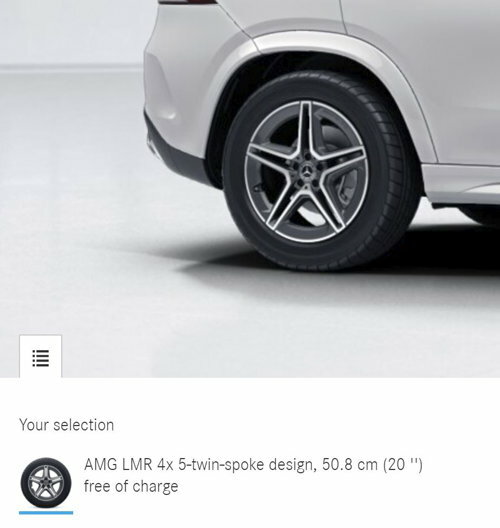 This is from the German configurator, which prices the AMG Exterior package pretty much the same as ours. Backing out VAT, German prices are 900 euros for the AMG 21s & 1900 for the 22s. You been drinkin’? Okay if you have, I have been. That appears to be my old spreadsheet, not an order. Last edited by GregW / Oregon; 11-12-2018 at 10:52 PM. LOL, I didn't even notice that he photocopied the spreadsheet (from your original) I emailed him earlier and included it with the build sheets he handed me. Maybe I should have a few drinks? I thought the AMG 20’s were free also but logically looking at the package cost they probably aren’t. Your dealer add makes sense. The E-ABC probably not going to be delayed. If it was one would think that the DOG would list the delay like it does with the one seat config. Is there a big advantage in delivery time placing an early order vs waiting for an updated DOG? I’ve attempted to discuss 5-6% off MSRP on an early order with 2 dealers and both don’t want to negotiate until they know pricing. When I “say cash, no trade” it takes away any wiggle room and the initial feedback is that a 6% discount is going to be difficult to attain. Last edited by Ron.s; 11-13-2018 at 07:43 AM. So that's the only place you saw the $1,750? The order sheet you posted above has no pricing. But apparently he was confused and wheel price was from my earlier sheet? If you go into the German Konfigurator you can select the AMG Line Exterior for 3,272.50 euros, which when you back out the 19% VAT, is roughly on par with the US cost of $2,900 (many times our cost in dollars is about equal to theirs in euros). Then when you go to wheel selection you will see the 20" AMGs are "free of charge" as in post #1013 above. I agree. And they've been featuring it and demoing it extensively. I would guess there is a good chance it will come out mid-year like on a normal model release cycle. The only advantage is getting "in line" for allocations. If you don't need to be one of the first and can wait 6 months or so negotiations should be a little easier. Looks like there won't be any "end of model year" clearances in 2019, though! Makes sense comparing to Germany-that makes the AMG package a no brainer and a VERY good deal! The base wheels are just plain cheap looking. The German AMG Line Exterior package upcharge price (without VAT) for the AMG 21s is 1,071 euros, so I'm estimating US$900-1,000. The 22s are 2,261 euros, estimate $1,900-2,000 US. Of course North America is not being offered the 22s at the current time. Last edited by GregW / Oregon; 11-13-2018 at 10:41 AM. Dumb question about TPMS. I was researching wheels and winter tires and a light bulb went on about TPMS. Does Mercedes have sensors in the wheel or is it like Audi monitoring the tire revolutions to detect low pressure. I assume there are Sensors but don’t find anything specific, is that the case? If so how do you reset a Mercedes. Trigger tool or is there a menu item or??. TPMS stands for Tire Pressure Monitoring System, but you could substitute Sensor for system, so yes, there are sensors in the wheels which are good for 5 - 8 years before the batteries die. When low pressure in a wheel is detected you get a warning. My wife had a severe puncture last Summer going over Mt. Hood and was able to pull over and save the tire. Resetting is via the menu system. Obviously if you have separate Einter wheels you need another set of sensors (Tire Rack has them). Last edited by GregW / Oregon; 11-13-2018 at 10:58 PM.